After having lost control of the Decepticon cassettes they had under control and public knowledge of the Transformers existing, Skywatch plans to send Thunder-Lizard 1 (alias Grimlock) into action. However, an agent for the Machination put a virus in the control program and Grimlock ends up waking up, his vocal system damaged. He escapes and Skywatch has to abandon the base. Scorponok and his Earthling Headmaster partner, Abraham Dante, attempt to bring Grimlock over to their side, but Grimlock isn’t ready to switch teams and decides to take him down on his own. Scorponok turns out to be too much for Grimlock, who manages to activate his old ship’s teleporter, bringing him to the Arctic-sunk vessel to find his friends. However, they’re still with Skywatch and the Machniation still wants them. What they got right: Simon actually let one of his pet characters be defeated? I’m rather shocked at that. I’m also shocked that Furman was willing to do the Headmaster bit properly, even if it’s with the wrong partner. The fight was also pretty good, and seeing Grimlock dealing with what he believes to be a betrayal of his fellow “Dynobots” shows some potential. What they got wrong: And yet we have yet another storyline on the pile already. What are we up to at this point, six or seven? You end up smothering good stories with this many subplots going on at one time. It remains my biggest issue with Furman as a writer, personal story preferences aside. Recommendation: A good story and possibly important to future events. It’s worth checking out but can this be the last plot for a while? 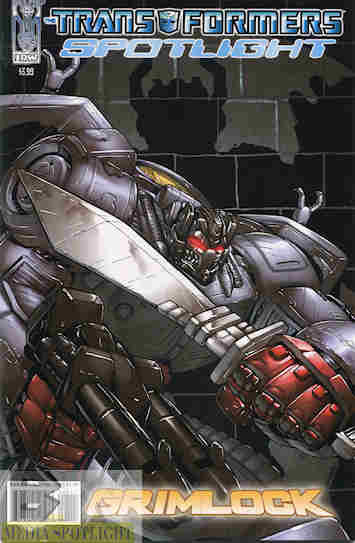 Posted by ShadowWing Tronix on February 8, 2018 in Yesterday's Comics and tagged Grimlock, IDW Publishing, Scorponok, Simon Furman, Skywatch, The Machination. In related Transformers news, I just found out that a five issue Transformers vs. Visionaries mini-series produced by IDW came out on Jan. 3rd. I don’t know whether or not I should give that series a chance, especially after what IDW did with M.A.S.K. Maybe I need to do some research on this matter. What is your opinion of a Transformers vs. Visionaries mini-series? Actually Issue #1 of Transformers vs. Visionaries came out in December 2017. It sold out so much and was so popular that a second printing of Issue 1 came out in January 2018. Also, Issue 2 hit the stands in January and Issue 3 is due out some point in February 2018. I will be picking up Robotech next Wednesday at my local comic store. If I see issues of Transformers vs. Visionaries there, I might pick it up. Are you interested in getting copies of this IDW series? For me, I’m intrigued to see what a “30 years later” interpretation of the Visionaries looks like as compared with the two issues I have from 1987 of 1988 of Marvel/Star’s Visionaries title. From my initial research, it appears that Ratchet works together with some Visionaries who are trying to stop other Visionaries from hurting Cybertron. I still need to research more on it.